As messy as it may get, I still impatiently wait for my share of mulberries that my mom-in-law sends us seasonally. Mulberries have high levels of protein and iron and help loosing weight by blocking sugar. We all don’t mind that last point, no! The second batch I received was almost overripe so I found a good use of them; squeezed some to make syrup “sharab toot” and preserved the rest as jam. While the mulberries were boiling to make jam, I thought to myself having this under my belt now, it sure tastes better with rich, flaky, soft scones. Sitôt dit sitôt fait, and the scones were baking in the oven. … later when mulberry jam was served with scones, I should probably had someone hiding the plate from me because it was kind of hard to stop eating! 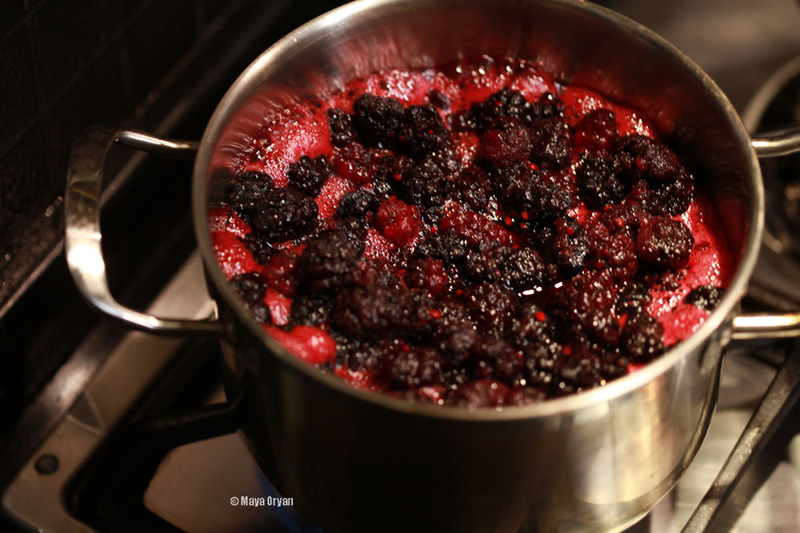 Heat it over medium heat and crush the berries to squish out the juice. Bring it to a boil then add the sugar and lemon juice. Reduce the heat and stir the mixture until the sugar dissolves. Preheat oven to 220°C. Mix the self-raising flour, sugar and the butter into a large bowl; rub in butter using your fingers until mixture resembles breadcrumbs. Whisk together the egg, the milk and the vanilla; reserve 2 teaspoons for glazing. Add the sultanas and the egg mixture to the flour kneading gently to a dough. Press dough out on a floured surface to 2cm thickness and cut out the scones out with a round 6cm cutter. 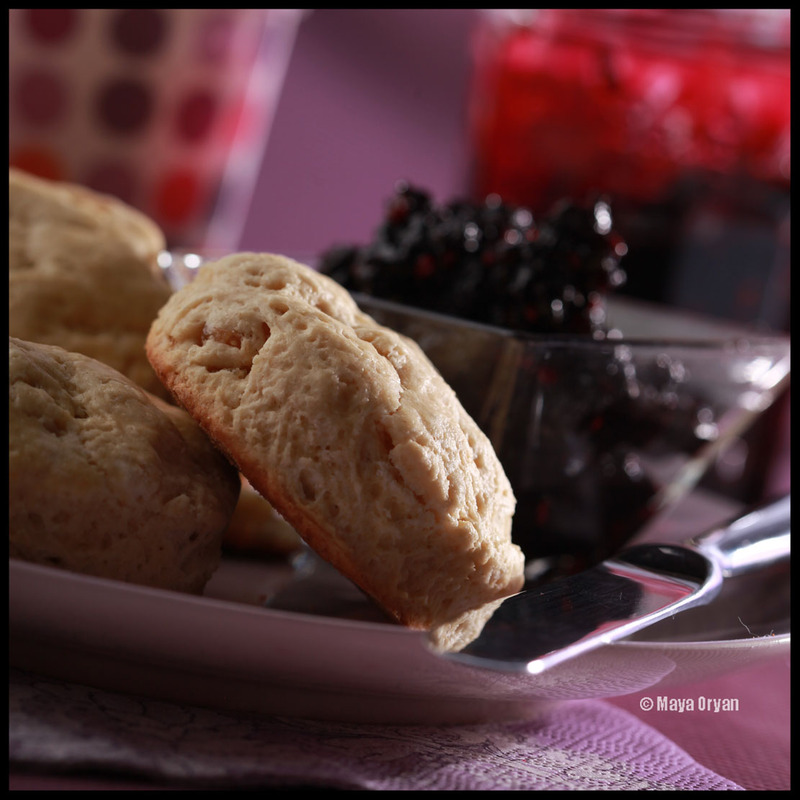 Glaze with the beaten egg and place the scones 2 cm apart on a baking tray into the oven for 10-12mn. Let it cool on a wire rack while covered with a clean tea towel for a soft scone result. These are best served slightly warm and homemade mulberry jam. This entry was posted in Breakfast, Desserts and tagged breakfast, Butter, Dubai Food Stylist, English Scones, Food Blogger, Food Stylist, Home Made Jam, Jam, Lebanese food stylist, MayaOryan, Mayas Ingredients, Mulberries, Mulberry, recipe, Scone, Toot by Maya Oryan. Bookmark the permalink. Very elegant. I might add some clotted cream. Delicious.